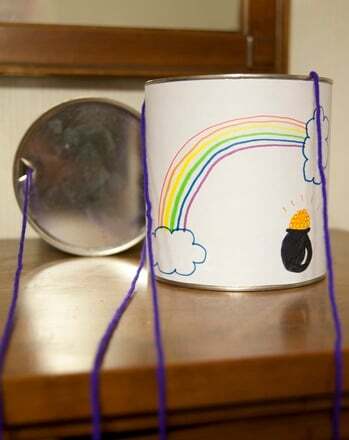 Celebrate spring in your house any time of year with this great craft idea. This fun activity is the perfect way to recycle that stack of old coffee filters lying around the house by recycling them and help your child transform them into Beautiful butterflies. You can use these coffee filter butterflies to decorate the house for a party or special occasion or even put them out on the patio when the weather begins to warm. Help your child spread out the coffee filters on newspaper or paper plates. You'll be using water and paints (or markers) that will leak through the filters a little, so make sure your activity area is well covered. If you can, try to use the “basket filters” since they are already circular in shape with a flat bottom, which makes them easy to flatten out. 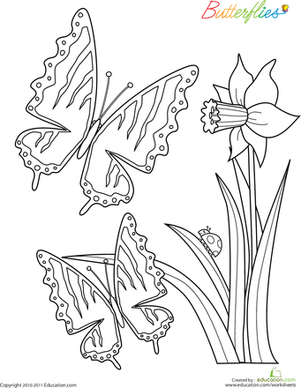 Let your child experiment with different colour and pattern ideas for her butterflies. If possible, read her a book about butterflies or show her a picture and encourage her to look carefully at their beautiful wings. What kinds of shapes and lines does she see? Does she see dots? Spirals? Then, let her go crazy painting the filters with the watercolors. If you want to give this project an extra twist, have your child draw her designs using markers. When she's done, give her a spray bottle filled with water and let her spray the filter. Watch what happens when the water hits the marker. She'll really get a kick out of watching the colors move and change. The filter will almost look like it has been tie-dyed! Let the filters dry on paper towels (or newspaper). Help your child cut the pipe cleaners in half (this may be too difficult for her to do on her own because pipe cleaners are tough to cut!). Then have your child take a filter and use her fingers to gather the filter in the centre, as if she is pinching it. Wrap a halved pipe cleaner around the gathered area and then twist it tightly into a corkscrew shape. Take another halved pipe cleaner, bend it at its centerpoint, and wrap it around the first pipe cleaner. You should end up with two pieces jutting out. Bend these pieces so they resemble butterflies' antennae. 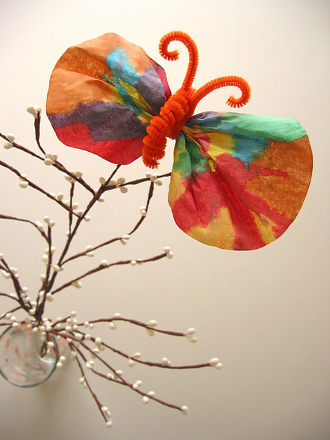 Your child has just transformed that old coffee filter into a beautiful butterfly! 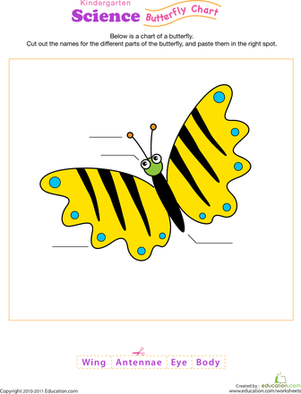 Such a dramatic change might remind you of a more fantastic one: the metamorphosis of a caterpillar into a butterfly! Butterflies come in many shapes, sizes, and colors. On this year one maths worksheet, they come with different numbers, too! Kids colour the ones with a 7. Some of these butterflies have lost their way! Your child will help them find their way while honing his maths skills. 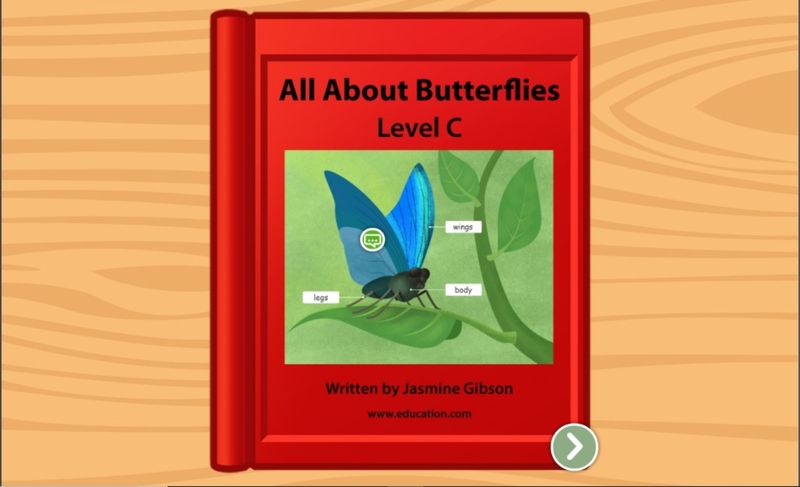 Learn the basics of butterflies in this interesting levelled book that introduces young students to the table of contents. Is your kindergartener digging butterflies? 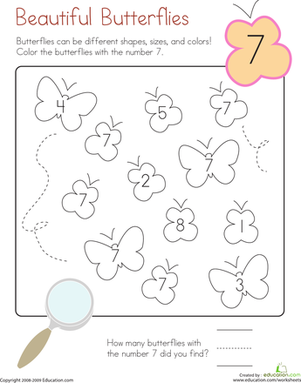 Test her butterfly know-how with this fill-in-the-blank chart!